1. Grind together the coconut, roasted gram, garlic, onion, green chilli, salt, tamarind and enough water to a smooth paste. 2. Heat 1 tsp oil in a small frying pan. 3. 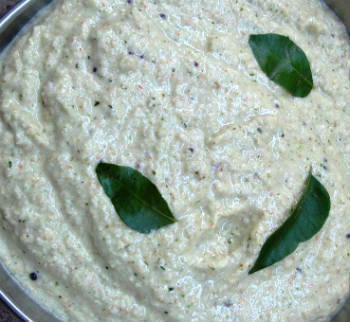 Fry the curry leaves, mustard seeds and urad dal for 30 seconds. 4. Pour over the chutney. 5. Serve with idli or dosa. Feel free to comment or share your thoughts on this Spicy Chutney Recipe from Awesome Cuisine.